Since 2oo7 onwards, this happens every year. People from all over the world who write in their blogs every year to promote different topics and therefore seek to make positive changes in awareness and in improving social standards, mutual understanding and the possibility of natural and pure lifestyle. This year on Blog Action Day bloggers chose the food theme, and today is the day when bloggers united using d hash tag # BAD11 analyze all aspects of food. From d moment what do we have on our menu, the future of d production of healthy food, using organic products to protect the resources we have. why this year’s theme is food is because the date coincides with World Food Day, and d cooperation with d bloggers was evident given that the topic has a lot to say and so much more specifically to change. When you have food as theme, we could write about it from several aspects as it penetrated further into the structure of what we think is important. If we take the social aspect of food, then you really should be worried about all territorial settlements on the planet where people are dying just because of lack of sufficient food for all. Essential not want to get into this segment, analyzing the results produced by this problem, on the contrary, I would like to make a parallel with some of the modern civilizations which are shed daily tones produced food, which although as part of d capital society, before undergoing throughout the economic chain that ended as waste. At the moment а thought or story comes to my mind d one that Mother Teresa once before landing from an airplane, flight attendants asked them to give all the food that remained on board so she could be able to give it to those in need at the moment, the hungry. ..
On the other hand if we thought about food, we could think of how often we eat, what kind/ type of food we consume, how we eat regularly, do we have a time table for food and so on. It is very important to emphasize that, no matter how dynamic life that we live and how irresponsible and stick in the other aspects of existence we are, feeding and using natural foods are an important element in healthy living and responsibility to ourselves and our health. making medical examinations is very important when we talk about diet and time of balancing the body and the products that are consumed. I would like to mention as a factor that personally observe the use of foods that are of natural origin and of course with enough vitamins and proteins needed by the body to fail to complete daily activities shall be imposed. Certainly today vegetarians are strictly satisfied. What we all support is d diet which we practice and d way how we food. I know it’s difficult to have such a diet (tried it by myself), but if not regularly at least once per time is nice to be purified from various calories receive the daily diet, just with that vegetarian kitchen that is not too difficult for d organism, and yet meets the needs of the body. That tragic aspect that this year the commune of bloggers raises is that the surge in commodity prices and changes in the economy doing in these two years ’10-11′ the poverty and hunger to increase. According to the World Bank further 70 million people face d particular problems. 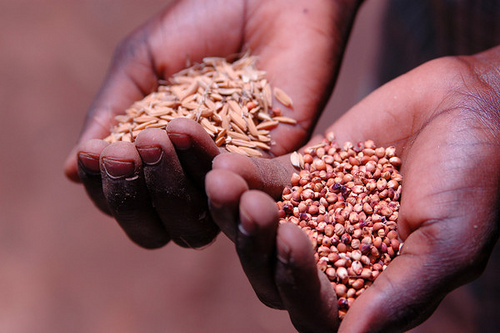 It is regrettable between ‘hungry’ to find themselves producers of food, but the fact is that they need to make purchases of other products which they produce and the money they earn with their products is not enough for subsistence. – What have you eat today? – Are there on the streets again today children that begging for bread? – .. Africa can sometimes be much closer to your eyes than you think ..
– In d laboratories d New potatoes are cooked, they should smell like onions and look like a watermelon. Forgot to say, yes, the will grow on trees! This year’s campaign is joined by another campaign “The F Word”, which seeks specifically to protect children and people who die from hunger in Africa. .. 30 000 children for three months. 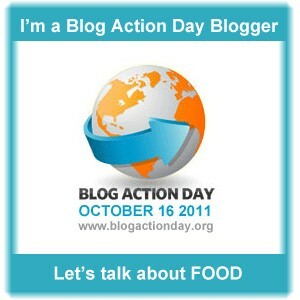 Blog Action Day 2011 is used to increase global awareness of this important issue. If you just want to participate in this day do not forget to share this infographic: Our beautifully designed infographic, “Fight Against Hunger”, which illustrates the countries that lead to their rescue efforts in the Horn of Africa and those who lag behind. Canada, Germany and Great Britain meet its obligations and participated with their aid, while France and Italy still have a job to do. To make sure the public knows it! Petition is open and if you want to fill: drought is an act of nature. Famine is man-made. Let’s put an end to famine. Bloggers from about 8o countries are participating in this action. If you want to participate in Blog Action Day & World Food Day 2011 you can do that if you are following d event facebook or twitter using the hash-tag # BAD11. If you are a blogger, then you can register @ www.blogactionday.org and post your content on Sunday, October 16, 2o11.